"Welcome to the Wisconsin Register in Probate Association website. Here you will find information to guide you through the process of probate, guardianship and adoption. We have included links to the Guide for Informal Estate Administration, forms and frequently asked questions in addition to other links for related information. There is also a directory of all county probate offices in Wisconsin. We hope you will find our website helpful and informative. If you have legal questions or need legal advice, please consult with an attorney." Mission Statement – to unite the Registers in Probate, Probate Registrars and Deputy Registers in Probate of the Wisconsin Circuit Court system into a unified body for the purpose of fulfilling the duties of their offices efficiently and effectively as dictated by law. 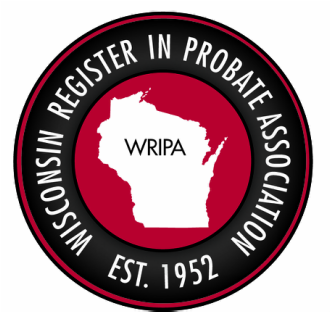 The first organizational meeting of the Wisconsin Register in Probate Association was held on April 25, 1952. The very first annual conference was held in September of 1952 and we continue to hold semi-annual educational conferences to this day. Since many Registers in Probate are also appointed Clerk of Juvenile Court, WRIPA works closely with the Wisconsin Juvenile Court Clerks’ Association (WJCCA) to provide up-to-date information and educational opportunities. please click on a tab on the left.